Six International Congresses ago, a 45-minute invited address in Helsinki introduced the use of computer animation in mathematical research and teaching. Word of mouth produced a demand for a second showing. Five years later in Warsaw, an improved version of the Helsinki presentation filled in for a cancelled invited address and once again there was a repeat performance. Now, twenty-four years later, we can return to the same themes and see how the advent of raster graphics, real-time display, and interactivity on the Internet can enrich our understanding of the geometry of surfaces, both for research and teaching. In the sections below, we follow the outline of the article in the Proceedings of the 1978 ICM, comparing the original text (in small type) to some current developments of the author and his associates. We concentrate on the work of the author and his associates since it is impossible to include a complete survey of the vast number of contributions that have been made over the past two decades. Our illustrations recreate the wire-frame images from the original article and juxtapose them with modern images using software developed by Davide Cervone. Theappendix is a narrative of the circumstances leading up to the presentation in the Helsinki ICM. 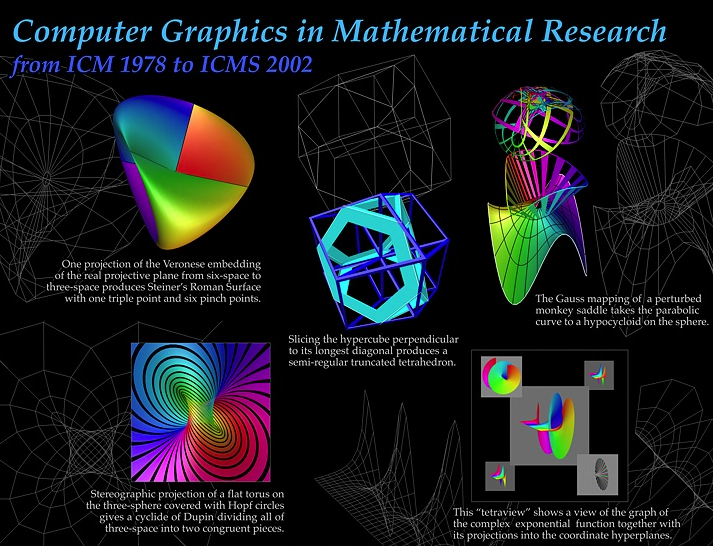 In the Helsinki ICM, the title of the talk was "Computer Animation and the Geometry of Surfaces in 3- and 4-Space" and that remains the focus of the research and teaching of the author to this day. Geometers have always used any available media to help them illustrate their work with diagrams, pictures, and models. Modern computer graphics provides a new medium with great potential both for teaching and research. Older methods of representing curves and surfaces by drawings on a blackboard or models in wire or plaster are frequently found to be inadequate in many important geometric problems, specifically those which involve objects undergoing transformations or objects which exist properly in the fourth dimension or higher. A high-speed graphics computer makes it possible to approach and solve such problems by methods that were unavailable only a few years ago. At the time of the writing of the paper, the "high-speed graphics computer" was a device that would rotate a not very complicated wire-frame model in 3-space in real time. Our system included two improvements that were especially useful for our research---a hardware matrix multiplier designed by Harold Webber that made it possible for us to rotate figures in real time in 4-space, and a routine that could interpolate linearly between wire-frame surfaces with the same parametrization. The next paragraph of the original article gave an introduction to computer graphics imagery that we take for granted today. There was a short discussion of motion clues versus stereoscopic pairs as the best way to view complicated geometric objects. Then, as now, the impressions created by objects in motion seem to work best for most viewers, especially in large audiences. We provide a background by rotating a wire-frame model slowly about a vertical axis in space. Subsequent deformations take place within this background. For example the slices of a surface made by planes parallel to a fixed direction appear to the viewer to be planar slices of the rotating figure. Although slicing by a linear function, or more generally by some other function, does require some computational ability, the machine operates quickly enough that it is possible to view a sequence of slices in real time, as if observing an object through a window as it rotated in the next room. Modern rendering techniques have largely made the background rotation unnecessary, although we ordinarily provide rotation about a vertical axis as an aid in viewing complicated surfaces. The slicing techniques referred to used a standard "marching squares" algorithm to identifiy intersections of edges with the slicing plane and to connect points on the same rectangle in the domain by segments. Since the parameter domains only included a few hundred rectangular cells, the computer could produce moving slices of a rotating object at a rate fast enough for previewing scenes. The effect, however, is greater if in addition to the slice, the film displays as well the part of the surface lying below or above the slice---the technique of water-level slicing. Since this technique requires more time per picture and since it is especially well suited to representations using color, this technique is used primarily in the animation mode, where one picture is made at a time, and then the finished film is projected at 24 frames per second. For color, filters are used and each frame is exposed several times for the different portions of the picture. It is hard to imagine computer workstations without color these days, but in the seventies they were rare. Multiply exposing each frame of a film to achieve a short sequence in color was intensely laborious, but the results were a striking preview of what we have today. In addition to projection, rotation, and slicing it is possible to use linear interpolation between figures with the same parametrization. Again this is fast enough that the technique can be employed for real time manipulation of the figures for videotapes or for on-line research. Video technology was extremely primitive at this time. There were competing standards and sizes of videotape, and it was nearly impossible to show a tape unless you brought the equipment with you, and even then it was impossible to project them for a large audience. Although standards took place very quickly in the United States, it is still complicated to show a videotape in other countries.